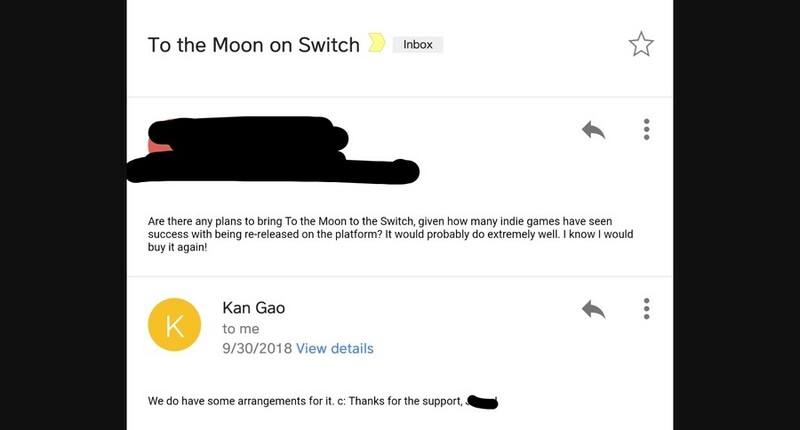 Just days after it was revealed SpeedRunners was likely to come to the Nintendo Switch when a fan reached out to the game's publisher tinyBuild via email, the award-winning PC and mobile indie title To The Moon has now been confirmed the same way. "We do have some arrangements for it." Much like SpeedRunners, this is technically the first official information about this game - originally released in 2011 - coming to the Switch. Obviously, we'll still have to wait for a more official announcement, before it is fully confirmed. Would you like to play this game on the Switch? Have you already played it in the past? Tell us below. So in theory, would this game allow me to see the final Nintendo Direct? That's the only thing keeping me alive at this point. I've heard lots of good things about this game, and I've been tempted by it every time it's included in a Steam sale (which is pretty often). However, if it is indeed coming to Switch, I'll probably be holding off for that version. Portability always wins! To The Moon is not open world unlike Kerbal Space Program. Man, this game! It has mediocre gameplay (what little gameplay there is) and the RPG Maker style graphics are nothing to write home about. And yet, it's so beautiful! The comments praising this game really do a lot to make me want to play it! I have this on steam and have played through it. If you can't take constant tugs at your heartstrings, you may want to skip this one. On the other hand, if you love a story that absolutely does that to you then you absolutely want this game. wasn't bad at all though. Why did that trailer already gave me tears in my eyes?.. Never heard of the game before, but now I want it so badly! I love this game. There aren't a lot of elements that make this a 'game', ie: theres really only walking and talking with very short and few origami puzzles. 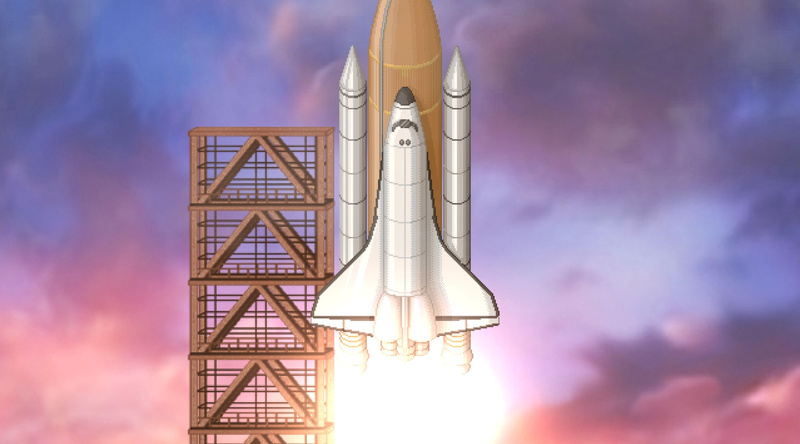 That said, the fact that it is in the format of a game helps push the story forward and gives the player quite a unique experience. Love the music so much and the eternal sunshine story vibe. 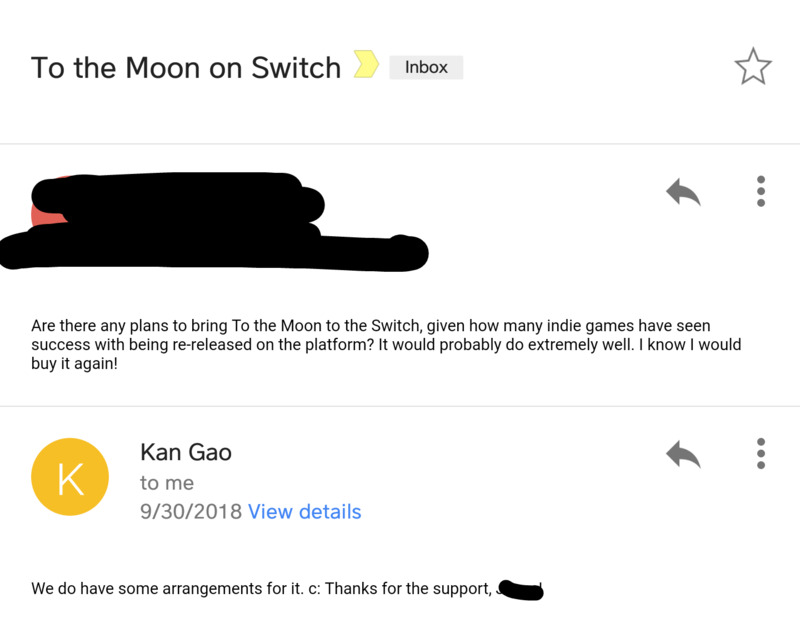 Thank you Kan Gao for the unforgettable experience and I would totally support him getting anything onto the console. I'd love a Bird Story/to the moon/the mirror lied- mixed on a cart... but I could see this only coming out digitally. Love this game. Cried my eyes out at the end. 100% would do it again on the Switch. Thank you everyone for the comments. The comments better explain the game than the video. I recently finished Forgotton Anne, which is 80% story and 20% game. Going into that game, knowing that, made it better. I will wait to see the price on this one. Oh the feels! Every time I hear any music from this game I get misty. It’s just so...touching. I would definitely get this game for Switch. The gameplay is nothing to write home about, but the story, dialogue, and characters for the game is amongst the best I've ever experienced. It's memorable and beautifully put together music adds a lot to the game as well. For those who haven't played it yet, I highly recommend that you do. It will put you through many different emotions from the beginning to the end. More of an interactive story than a game, though it does have a few puzzles. As the fellow whose avatar has been from this game since playing it, yeah, for anyone looking for an interesting, original story, this game provides. If you have any interest, it's well worth the purchase.